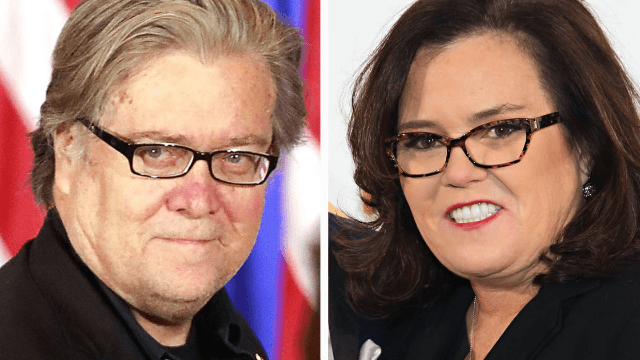 Rosie O'Donnell tweeted Monday that "if called," she would "serve" her nation—and comedy institution SNL—by stepping onto the 30 Rock stage as Trump chief strategist Steve Bannon. It's common knowledge that O'Donnell and Trump have a long running feud. The man even called her out by name during the first presidential debate. But where this story really gets started—and fascinating—is with Melissa McCarthy's impression of White House Press Secretary Sean Spicer last weekend. While Spicer played off her phenomenal impression in comments to the media, calling the show "funny" even if he thought McCarthy "could dial back," a Monday report from Politico posited that reactions weren't so cheery behind the scenes. On that line, the people took to Twitter. It was time to draft Rosie O'Donnell into SNL's war of impressions. With Trump reportedly bristling over media reports and SNL parodies about advisor Steve Bannon's outsized influence in the White House, imagine the following sketch. Steve Bannon lords over Trump at the Oval Office, covered, as he has been so far on the show, in a grim reaper costume. Trump asks: "Who are you, anyway?" Bannon rips off the hood. It's Rosie.